Majority of patch cables used in networking world these days are Straight Through Cables. Both end of these UTP cables are truncated at RJ45 (Registered Jack 45) connector. We can see from above diagram of UTP cables that there are eight small wires in it, these eight small wires are twisted in four pairs. Each pair has different color scheme. In traditional 10/100 Mbps networks only two pair of wires are used for sending and receiving, while in new gigabit standard all four pairs are used for data transmission. To understand how these types of cables work, it's important to have sound understanding of Straight Cable Color Code. 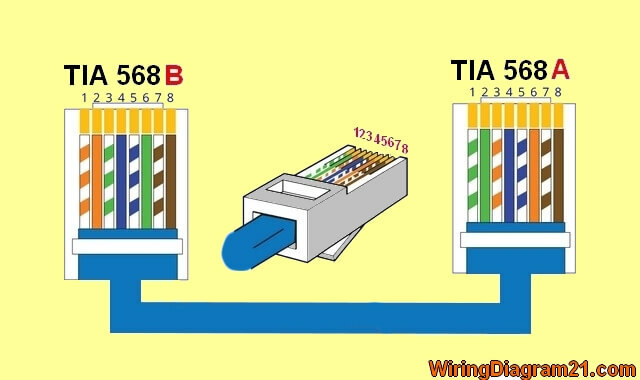 There are two color coding standards for straight through cables, these are EIA/TIA 568A & 568B. These color coding standard tell which color is connected to which end. We now look at details of these wiring standards. This color coding standard is not widely used these days. Below is diagram of straight cable color coding based on 568A standard. Next we illustrate sending and receiving pins in 568A color coding standard. This is the most widely used color coding standard of current era. Almost all Straight through cable these days are following T568B color coding standard. 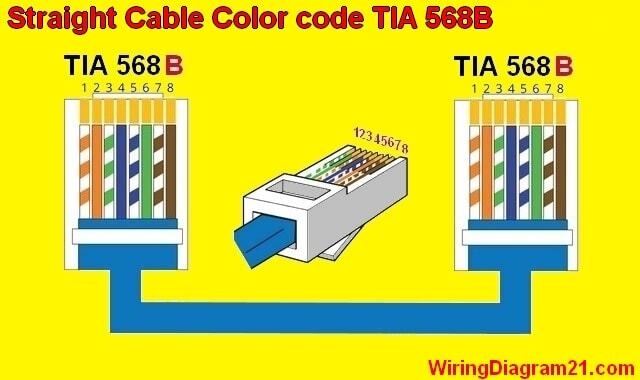 Below is straight through cable color code and wiring diagram that is using 568B standard. It's called straight through cable since all wires are connected at same pins on both sides of wires. You can see that in both figures of 568A as well as in 568B. There is not much difference between 568A and 568B, you can see from above diagrams that only green and orange pairs are swapped, rest combination remains same. An important point to remember is that whether you use 568A or 568B, make sure both ends of wire is following same standard. Which means if one end of wire has 568A standard, other end must also have 568A and vice versa. Today's devices are getting intelligent, due to introduction of Auto-MDIX standard. With Auto-MDIX, devices can automatically adjust sending and receiving pins. So any wire can be used for connecting same or different devices.